Standing high atop a hill in southern Tuscany not too far from Siena, Montepulciano is a medieval town of rare beauty highly recommended visiting in Tuscany. The city, full of elegant Renaissance palaces, ancient churches, charming squares and hidden corners, boasts vast panoramas all over the wonderful Val d’Orcia and Val di Chiana valleys that surround it. 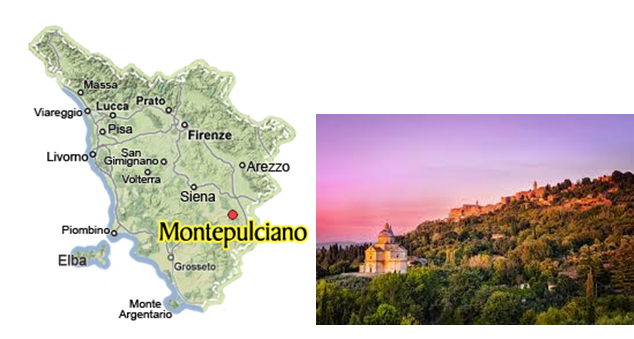 Montepulciano’s strategic position makes it a perfect base from which to explore this beautiful corner of Tuscany; from here, you can reach the charming Pienza, the thermal village of Bagno Vignoni, the famous Montalcino and a lot of other enchanting villages in a very short time. Just be prepared to share the town: Montepulciano has received great attention following the filming of the vampire saga Twilight sequel New Moon here and has seen a notable increase in visitors. Piazza Grande is the heart of Montepulciano and the setting for its main events, including the barrel-racing Bravio delle Botti contest held in August every year and much more. A walk through Montepulciano is the best way to view the town and its beautiful landmarks as well as enjoystunning views of the surrounding countryside covered by vineyards producing the famous Nobile!